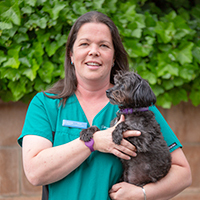 I have been in the veterinary industry since 2006 and decided to go back to college in 2010 to gain my qualification as an RVN (registered veterinary nurse) which I completed in 2013. I started my career in falconry and travelled the country doing school talks, public displays and corporate events and continued with the animal theme where I was the yard manager of a stud in Bedfordshire and there after returned home to Fife to raise my family. I started at provost as a locum nurse in 2015 and thereafter was offered a full time position with the team in 2016. I am currently in the role of Practice Manager and still have a couple of days to continue my nursing at the Ladybank branch.